The notion of a mass-arrest scenario of all criminal elitists and their minions may be one of the most satisfying and exciting thoughts for any of those in the alternative community. For years now, we have waited patiently for progress to be made in this regard and have been hopeful that monumental change was only right around the corner. There are a number of scenarios which we have imagined in which these arrests might take place. Some pictured them taking place all at once and that the United States infrastructure might need to be taken offline for a number of days. Others picture a gradual change in which a few elitist criminals are arrested at a time until there are none left to cause any trouble. Whatever the scenario might be, we might all agree that we very much want these arrests to take place, and fast. According to several whistleblowers as well as corporate media sources, we might be in for a pleasant realization, but as of the moment of this writing, the details are still somewhat hazy. The rumors have been mounting, but now, new intel has been received and the supporting evidence thereof has been compiled. Now we may wait and observe what the coming weeks and months will make of the situation of high-level arrests. 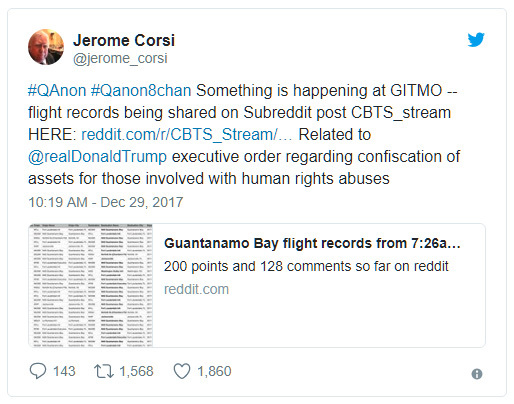 Since late December of 2017, we have seen particularly significant developments on the covert and online efforts to inform the people and liberate the world from Cabal control. We have heard rumors and have seen executive orders promoting the elimination of both elitist monopolies and global financial schemes. The corporate media even seemed to support the notions we have heard from these covert efforts. The mass arrests which took place in Saudi Arabia were a particular development which acted as a sign to the world that massive change and clean-up of rampant corruption is very possible. To add, the executive order by President Trump to freeze the financial assets of all of those suspected of crimes against humanity reiterated the point that change is more than possible. These tangible and internationally visible moves were among the global developments which took a story from an obscure social media website, and helped the public realize that these supposed half-baked rumors were actually real-world fact. Yet even with the tangible evidence we have that change is upon us, there are still a number of questions that are not yet answered, still a number of proposals that have yet to be proven, and a long list of issues that have not been addressed. While we wait patiently and intend to see fair and complete justice served, let's take a look at the evidence and intel that we do have. In order to understand the setting and the situation, it is important to understand why GITMO is so significant in this regard. The base has a unique purpose and quite an extensive history. To help us understand both, here is Thought Co with the details. In 1898, the Spanish American War united Cuba and the United States. Aided by the U.S., Cuba fought for independence from Spain. That same year, the U.S. captured Guantanamo Bay, and the Spanish surrendered. In December of 1898, the Treaty of Paris was signed and Cuba was granted independence. At the wake of the 20th century, the U.S. formally leased this 45 square mile parcel from newly independent Cuba to use as a fueling station. The lease was renewed in 1934 under Fulgencio Batista and President Franklin D. Roosevelt's administration. The agreement required consent of both parties should either want to withdraw; that is, reconsider U.S. occupation of the base. Diplomatic relations between the U.S. and Cuba were severed in January of 1961. In hopes the U.S. will forfeit the base, Cuba no longer accepts the $5,000 annual American rent. 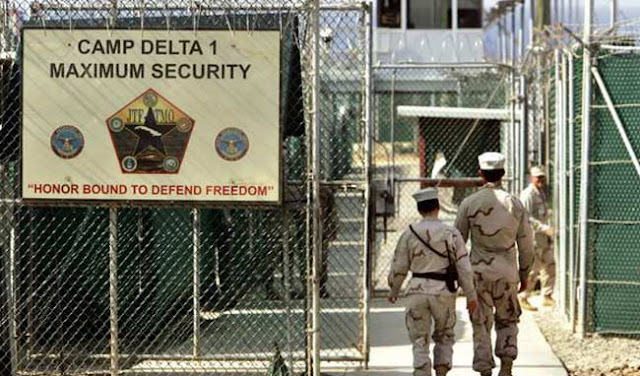 In 2002, Cuba officially requested that Guantanamo Bay be returned. In 1964, Fidel Castro cut off the base’s water supply in response to the U.S. government fining Cubans for fishing near Florida. As a result, Guantanamo Bay is self sufficient, and produces its own water and electricity. The naval base itself is divided into two functioning areas on either side of the bay. The east side of the bay is the main base, and the airfield occupies the west side. Today, both sides of the base’s 17-mile fence line are patrolled by U.S. Marines and Cuban militiamen. Following the September 2001 attacks on the U.S., several detention camps were built at Guantanamo Bay which held hundred of detainees. As of 2010, facilities remaining in operation include Camp Delta, Camp Echo, and Camp Iguana and about 170 detainees remain. Many of the prisoners originate from Afghanistan, Yemen, Pakistan, and Saudi Arabia. There is longstanding debate over Guantanamo Bay’s role as a detention facility, particularly among lawyers and human rights activists. Its true nature and inner workings are somewhat elusive to the American public, and are under constant scrutiny. One can only speculate the future of Guantanamo Bay and as history suggests, its utility and habitation are ever changing. 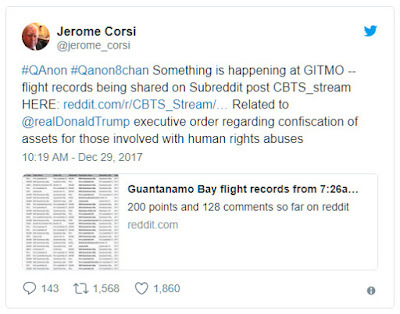 We may note the commentary on the legal disconnect between the United States and the GITMO installation. Being that the base is said to be the legal equivalent of "outer space," I think it is safe to say that there is no connection between that locale and the U.S. This unique legal standing seems to fall in line with revelations of classified locations which are completely legally independent from U.S. law. Only the other bases discussed on these subjects are reported to actually be located in outer space as well as deep under ground. Compared to the latest rumored occurrences at GITMO, the history of the installation may not seem as exciting. However, we may keep in mind the point about the base being used for housing individuals that are considered dangerous terrorists by U.S. authorities. It is also interesting to hear that the purpose of the base is consistently changing, and according to a recent mainstream article, its purpose may be changing in a very significant way in the very near future. In fact, it may have changed already. Here is a recent article which demonstrates the of unusual goings on at the Guantanamo Bay installation. This is the New York Post with the story. Defense Secretary Jim Mattis visited the US Navy base at Guantanamo Bay, Cuba, on Thursday to offer holiday greetings to troops — the first trip there by a Pentagon chief in almost 16 years. Mattis did not tour the detention facilities or discuss detainee policy options during his stay, which came amid uncertainty over the Trump administration’s policy on continued use of the military prison. President Trump hasn’t released any Guantanamo prisoners or added any to the list of those who have been officially cleared to go home or to a third country for resettlement. The last defense chief to visit Guantanamo Bay was Donald Rumsfeld, who went there in January 2002, just weeks after the first detainees arrived from Afghanistan in the early stages of the fight against terror. US Attorney General Jeff Sessions, who visited the facility in July, underscored the administration’s support for continued use of the prison. He called it a “perfectly acceptable” place to detain new terrorist suspects, as opposed to holding them in the US and having his own Justice Department try them in civilian courts. There are a number of interesting points made in this article from New York Post. The first point that struck me was the fact that Secretary Mattis visited GITMO unexpectedly. This could mean a number of things, or it could be nothing. However, let's consider the possibility that the unexpected and unplanned nature of the visit by Mattis had a sense of urgency about it. In general, the Secretary of Defense does not need to visit a facility simply for rudimentary procedures or tours. If they did, these types of events do not typically take place by surprise, as stated above. From the data we have, it seems likely that the unexpected visit represented some type of change of pace with regard to the nation's stance on defense against terror of various types. To add, the function of the facility seems to be in question as well, as Secretary Mattis seemed intent upon changing things up on the fly. Perhaps the visit could not be planned because the operations which preceded it were of such sensitive nature that even military personnel could not be pre-warned of the need for such details to be hashed out. This is only speculation, but is still notable. We may also notice that there were no prisoners cleared to leave the facility and that Mattis was apparently interested in delivering "new terrorists" to the facility at some time in the near future. This could mean a number of things, but it seems as though Secretary Mattis knew that one or more dangerous enemies of the United States may be coming to the facility for an extended visit and trial by military court. It seems particularly interesting that Mattis emphasized the intent to avoid civilian courts in the United States. What was it about the civilian justice system that Mattis was interested in avoiding? Some suspect this move by Mattis and the defense department to be related to trying high-level prisoners who might slip through the cracks within American civilian courts. They believe that in order to try these prisoners properly, they will need to remain completely independent from possible corruption in American courts. This too is speculative, but also notable. According to a number of credible whistleblowers, there are, in fact, several high profile criminals that are booked for an extended stay in the GITMO base preceding trial for serious crimes on various levels. These trials require the special hand of the military in order to be handled properly, and in order to avoid any possible negative propaganda promoted by the corporate media, the operation is being kept quiet. If this intel proves to be true, this would explain the recent uptick in questionable uprisings and protests in the United States. We have recently seen a rise in protests which appear similar to those of early 2017 immediately following Trumps inauguration. Most of those uprisings were found to be caused by George Soros and his attempts to usurp the current American government, and the same may be true here in early 2018. If George Soros is sitting in a prison cell at the GITMO installation, this might explain this new uprising of protests after such a long time of silence. If Soros were backed into a wall, he might use the last of his funds to attempt to hold the country hostage in exchange for his own freedom. This is only a possibility, but seems to fall in line with the past personality traits of Soros and other elitist manipulators. Whatever the details of the Guantanamo base are, one thing is for sure: things are definitely changing, and fast. As of right now, we cannot say for certain what the reasoning behind these changes are. However, we can observe the major events that are taking place on a global scale and know that it is only a matter of time before the truth makes itself known in full.